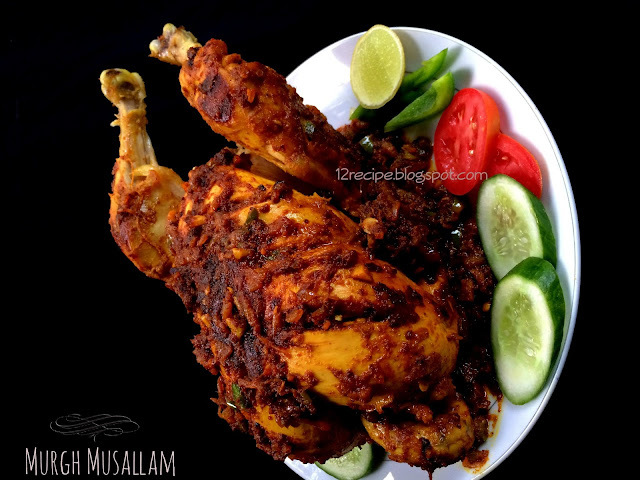 Murgh musallam is a traditional Mughlai Chicken dish in which the whole chicken is stuffed, steam roasted and then cooked in an onion based thick gravy. Its's mainly cooked in the special occasions and surely it will be the highlight in party table. Even though the preparations include few steps; the end result was awesome lip smacking chicken!!! Pat it dry with a kitchen towel to avoid the extra moisture. Using a knife pierce chicken breasts and other parts a number of times. Marinate it with the lemon juice and salt (rub evenly to well coat). Heat oil in a pan; saute thinly chopped onion for few minutes until transparent. Add ginger, garlic and green chilly; saute for a minute. Add chopped tomato pieces and saute until mashed well. Then add minced liver pieces and saute for another 3 minutes. Remove this all masala in one side of the pan; and in another side crackle an egg and mince it well by adding a pinch of salt until done. Mix it with the whole onion mix and then add pepper powder and enough salt. Switch off the flame and allow to cools down; before stuffing inside the chicken. Take out the lemon marinated chicken from fridge. Stuff the onion filling inside the chicken by pressing well. Now close the inner opening of the chicken by sewing the legs each other with a thread (or with a skewer check here). Mix all the ingredients well and make a fine paste out of it (if desire add little water). Coat it over the chicken and rest for another 15 minutes. After that take a non-stick wide bottom pan (to sit the chicken properly). Heat two tablespoons of oil in in. Place the chicken inside it and make the flame to simmer mode(very low). Soak the cashew nuts in 1/4 cup of hot water for 5 minutes and blend it along with the water to make a puree. Heat oil in the pan and saute thinly chopped onions until transparent. Add ginger garlic crushed and saute for a minute. Add all the powders one by one in low flame; mix well. Add cashew paste and coconut milk. Switch off the flame by adding the coriander leaves. After one hour of cooking the chicken chicken gets evenly cooked and the top gets brown in color. 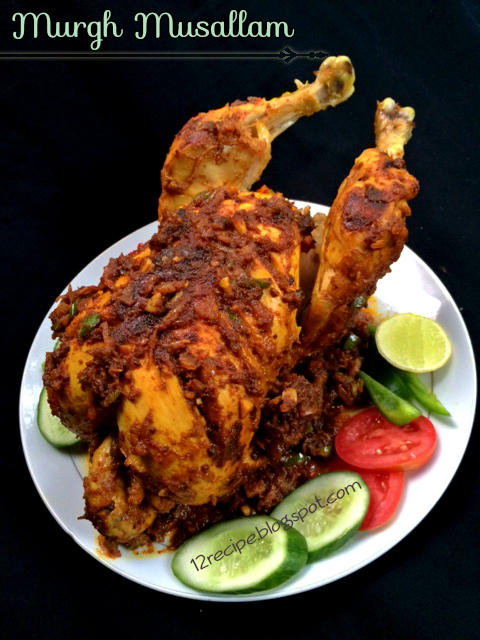 Pour this cooked onion masala on top of the chicken. Coat it well with the chicken and cook for anther 15 minutes on medium flame until the masala get dried and well coated with the chicken. Switch off the flame and Your chicken is ready to serve!!! Remove the thread from the chicken before serving. Serve it on top of a veggie salad bed or rice.